Professor Mikko Taipale believes cures for genetic disorders already exist. We just have to find them. “I have the second best job in the world. The first is being an astronaut,” says Taipale, an assistant professor of molecular genetics at the University of Toronto’s Donnelly Centre. With his feet firmly planted on the ground, Taipale is finding cures for genetic diseases. 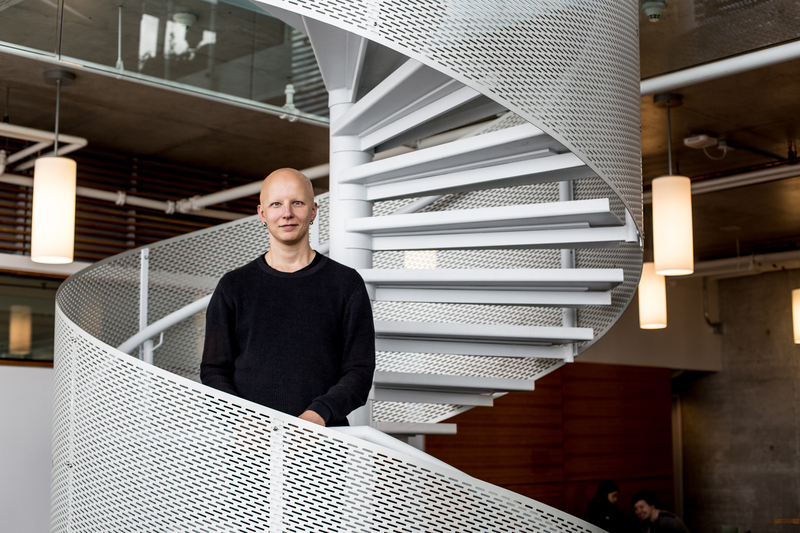 Taipale, 39, has won an inaugural $100,000 CIFAR-Azrieli Fellowship. The award was given to 18 scholars worldwide, who are less than five years into their first academic appointments, by the Canadian Institute for Advanced Research (CIFAR). Among the other winners are U of T professors Natalie Bau (economics) and Luyi Yang (physics). “This group of phenomenal young investigators is the future of research,” said CIFAR President and CEO Alan Bernstein in the institute’s announcement. Taipale joined the Donnelly Centre in 2014 after a post-doctoral fellowship in the lab of Professor Susan Lindquist at the Whitehead Institute for Biomedical Research and MIT, where he studied how proteins – the end products of genes – fold into three-dimensional molecular machines. At Donnelly, he has expanded his research to a number of cellular processes that ensure proteins are properly made and working, in order to understand what makes cells healthy and how changes in protein biology cause disease. One of Taipale’s projects sets out to investigate rare and debilitating – but often overlooked – disorders. “We want to democratize research in rare diseases because most of them are completely neglected. Developing a new drug costs $1.2 billion and you cannot recover those costs if you only treat thousands, or even hundreds of patients in some cases,” says Taipale. A rare genetic disease occurs when a particular gene is mutated so that the protein it encodes no longer works. For example, mutations that impede the function of proteins encoded by the genes CFTR or dystrophin will cause cystic fibrosis and muscular dystrophy, respectively. Such harmful mutations run through family trees but only wreak havoc in a small number of people. That’s because we carry two copies for every gene, one inherited from each parent. If one copy of a gene is broken, its harmful effects are masked by the other working copy of the gene. It’s only when someone inherits both bad versions of the gene that they get sick. Unlike complex diseases such as cancer, which are caused by mutations in many genes, rare diseases are an easier problem to solve. If you could find a way to restore the broken gene’s function, you might be able to alleviate symptoms or cure the disease altogether. Still, a relatively small patient population means that the pharmaceutical industry has little incentive to invest in these diseases. But what if drugs already existed? What if they lurked among thousands of compounds that have already been approved or are being developed for other conditions? “We’re trying to completely change the way in which we study rare genetic diseases. Traditionally, these diseases are studied one at a time with multiple methods, and we want to study one thousand diseases all at once, with one or two methods” says Taipale. To do this, he has a collection of 1000 mutant proteins – each carrying a mutation known to cause a genetic disease. The plan is to run a battery of tests on these damaged proteins, side-by-side with their healthy counterparts. “These experiments will help us understand the underlying molecular causes of disease. Then we can use FDA-approved drugs to fix the damaged proteins. We are trying to find a disease for a drug and not a drug for a disease,” says Taipale. Taipale cites an example of lonafarnib, a failed cancer drug that was repurposed to treat progeria – an extremely rare condition where aging is accelerated so much that patients die of old-age complications in their teens. The drug works by reigning in the rogue progerin protein, which is the underlying cause of the disease. “Even if you hadn’t known anything about the molecular biology of progerin, and done a screen with FDA-approved drugs and drugs in clinical trials, you probably would have found the same compound. I have a hard time believing that out of 7000 rare diseases this would be the only one that has an existing drug that could work. Maybe we’ll be able to make a difference for one of these 1000 diseases that we study, but I have no idea which disease it will be,” said Taipale.